Today was going to be a busy day. It was going to involve several family visits, a family meal and 100 mile return trip to Somerset from South Wales, so my time bank side was going to be limited. I was also travelling very light with 2 reels, 2 feeder rods, a landing net, a handle and a box of rig bit essentials. I was hoping for a very productive session and with a few venues very close to my parent’s house offering this I was spoilt for choice. In the end I went with Cefn Mably on the advice of a mate of mine (Dale). To be honest he echoed what I was already thinking “They all fish the same! Just fish close to the island and don’t forget to feed the margins!” so with that advice I decided veer away from my favoured Horseshoe Lake to try out one of Cefn Mably’s newer lakes, the Bridge Pond. Packing a very basic amount of fishing gear and getting up quite early I was on the way shortly after 8 and on the bank ready to fish by 9.15. The lakes have been there for about 10 years and it has definitely been designed as a match lake. Set out in a figure 8, almost every peg had an island feature to cast too, and the margins were suitably developed to offer a lot of options. With an immovable time constraint I decided I would fish then venue as if it were a four hour match. I knew there were plenty of fish about (some were surfacing and a small carp was being caught as I prepared my groundbait), so hoped today’s efforts would be fruitful. 8ft – TF Gear Compact Feeder – 6lb Reflo Mainline, 1/2 ounce Preston Bullet Cube – 5.2lb Middy Lo-Viz haired hooklength on a size 16 QM1 hook – In the margins. For groundbait I would be using Sensas Krill mixed 50/50 with micro halibut pellets. I have used Sonubaits Krill pellets on the Horseshoe lake in a previous session and they were absolutely lethal, so I was hoping to replicate the results today. Finally for hookbait I had half a pint of maggots, half a pint of casters, a tin of meat and a small box filled with a selection of Halibut Pellets (6, 8, 10 and 12mm). Settling down and getting comfy on my chair I quickly became aware how cold it was. There was a constant breeze in my face, and as I had chosen a peg nearer the corner it offered no respite from the wind. The fleece would be zipped up to the top for the this session! I found my casting distance and clipped up, and began “ringing the dinner bell”. I wasn’t going to cast as often as I initially intended (every 2 minutes) as the water temperature was colder than I anticipated, but a cast every 5 minutes should get the swim going. Sure enough, on the second cast the tip registered a slight knock and on winding in the 8mm pellet had vanished! I cast out again, this time nothing for 3 casts, yet the chap 4 pegs to my left was into a fish on a centrepin – fishing mid channel, mid depth on meat. On the 4th cast, after retying a hooklength (increase the hair length), and about 30 – 35 minutes wait (since beginning the session) the rod registered one pluck, and then hammered around. 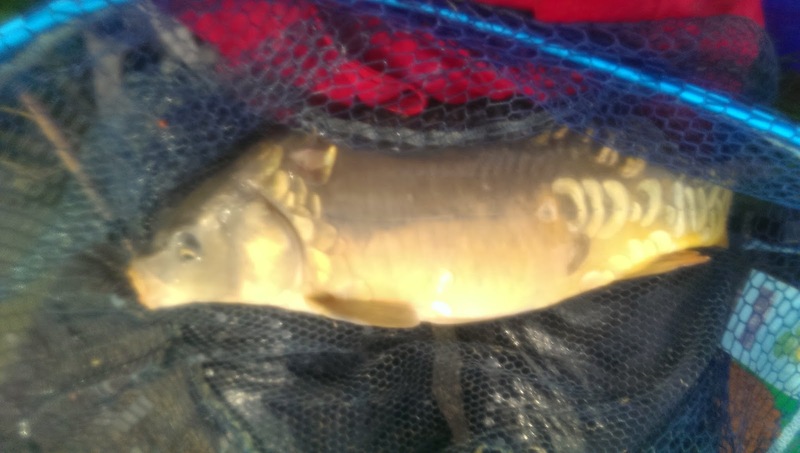 The fight was a bit of a let down though and I brought to the net a bin lid of a fish around 4 – 5lbs. In fact it was livelier on my lap than in the water and soaked my phone (resulting in a foggy photo). I returned the fish to the water when I noticed another angler had taken up residence on one of the spare pegs between me and Mr. Centrepin. He was casting mid channel, then after 2 minutes, decided to fish his right hand margin, then after another 2 minutes decided to fish to the island. This meant he cast about 4 feet away from where I was fishing. Unfortunately the curving angle of the bank meant the place he was casting to was in fact his swim, it was just unfortunate that it was also very near my swim. It was a bit weird when every time he cast to that location he would look directly at me after casting, but time was ticking on so I didn’t say anything. The lake seemed to be quite inconsistent and no one was catching with regularity. Another 20 minutes or so past without so much as a bite. Not ideal. I carried on dropping in golf ball sized nuggets of groundbait into the margin and before long I saw the edge of a tail break the surface. Winding in the one rod and baiting the compact with a 6mm halibut pellet I lowered the hookbait on to the fishes head, within 2 seconds the rod pulled around and the fish darted right out into mid water. I must say, the TF Gear rod was my brothers and it handled the fish really well. At 8ft long and with a choice of two tips it would make a great rod for some of the smaller rivers in my neck of the woods. I was however left quite worried about my old Shimano 3000 GTM. On several occasions during the fight the anti reverse failed, only to re-engage after winding down a little bit more, then failing again. Maybe it’s almost the end of the road for old Suzy Shimano… That would be a sad day indeed. I would like to say I photographed this fish which fought a lot harder than the previous on,. But after unhooking it in the net on my lap this fish made a enormous jump and torpedoed out of the net, off my lap and straight into the lake. I couldn’t believe it! The fish was a nice mirror up around 7lbs. 2 fish for over 2 hours work seemed like hard going, and I have never fished Cefn Mably and “fished for bites”. Normally it’s a case of waiting for the fish to switch on, which they normally do in about 30 minutes from “ringing the dinner bell”. A quiet 30 minutes followed in which I switched hooklengths down to 3lb Powerline on a size 16 spade end Kamasan B911. Using double caster and double maggot yielded plenty of bites, but nothing seemed confident to take it down, I could only put it down to changing weather conditions. The group of lads to my right caught the occasional carp when they made it to their bite alarms in time, but looking around no one was taking the lake apart and subsequently the disappointment was starting to set in. With 40 minutes to go I reduced my feed to almost zero and used small 6mm cubes of meat and a hair. My first cast into the margin resulted in a huge pluck, but on lifting the bait out, the bite seemed to be enough to strip the meat from the hair! I cast out again and this time I struck on the bite. I think I must have foul hooked something because whatever it was took off like a train and all I was left with was a small, split scale on the hook. I cast back out to the island using meat on the hair. With 15 minutes to go the rod tip pulled around and I struck. This was something much more sizable than the previous fish and with a purposeful surge it ploughed off to the left…. Towards a snag. I felt the line go solid and after a bit of a heave I brought to the bank a rotten twig. Fortunately I didn’t lose any tackle and cast back out another piece of meat, hoping to snare something at the death. Sadly this last elusive monster never materialised and I called it a day as planned at half 1. I left feeling quite disappointed, and a bit fleeced. £8 is steep, Cefn Mably having the reputation it has, of “always producing” and that coupled with Bridge Pond consistently pumping out 100lb+ bags of Carp, meant 2 banked fish for 4 hours work left me feeling quite miffed. Maybe today was one of those days and as said previously, everyone seemed to be struggling. The overnight rain, drop in water temperature and cold wind may have also had an effect on proceedings but truth be told, I was glad when I was back in the car with the heater on! I don’t imagine I’ll be back over the bridge much before Christmas, so won’t be venturing to Cefn Mably before 2015. When I do decided to return hopefully it’ll be a bit warmer too! I’m not disputing the place is full of fish, but I’ll aim to fish there again when I know they are feeding in earnest! On the upside you can park very close to the lake and with the assistance of someone pushing, and as the pegs are all flat and stable you can get a wheelchair right next to the lake. Which is great news for disabled anglers out there! Value for Money – ** 1/2 – £8 was steep for such a poor day. Undoubtedly, next time I fish there this rating will be void and I’ll catch zillions of fish – I also contacted them previously via their facebook page to ask which lakes were fishing well, but received no reply. Disabled Access – *** 1/2 – You can get quite close to the lake and with assistance getting bank side should be quite achievable. FISHING!! Good post. Cefn mabley is on the hit list for when I've got more spare time. FISHING!!! Hi Paul,. I’ve regularly fished at Cefn Mably since I had both my knees replaced, the first at the end of 2006 and the second at the end of 2008 so your blog is essential reading for me, keep up the good work. 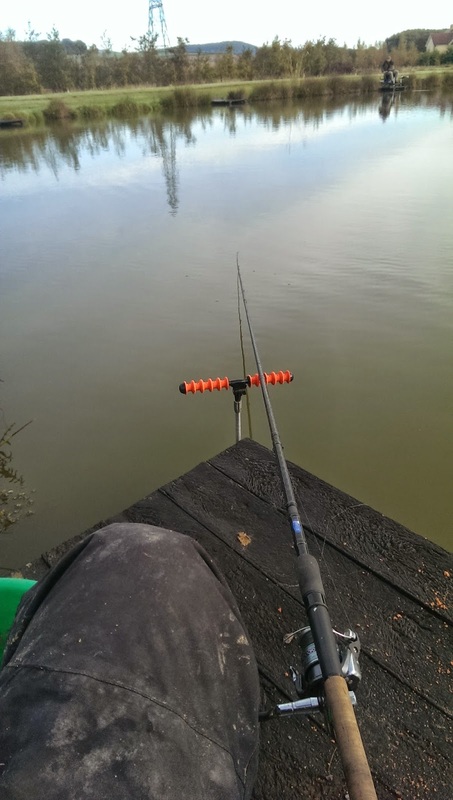 The ease of access and the relative flatness of the banks at Cefn Mably allow me to fish in comfort and with the confidence that I won’t have difficulty getting to a fishable peg. Thanks very much for you comment John. I know the lake fishes very well, I think it was just a slow day for me. I'm glad you had a good day, I may have a go around Christmas time. I'm glad you find my blog useful, I think it quite useful, even to remind myself of access, what I used etc. Best of luck fishing in future! All the best, Paul.